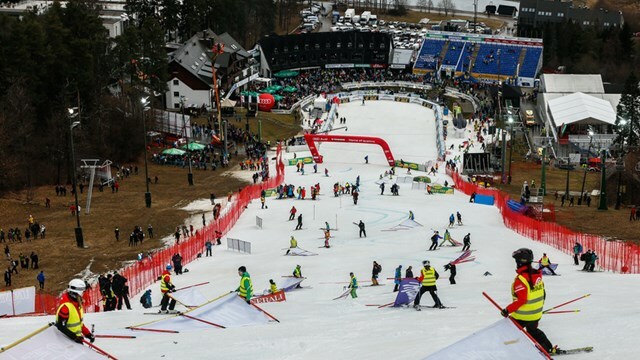 Garmisch-Partenkirchen, Germany & Maribor, Slovenia – Warm, wet weather and soft, unfavorable course conditions cancelled both the men and women’s Audi FIS Ski World Cup races scheduled for Sunday. At the women’s slalom in Maribor, Slovenia, start times were move back as crews worked on fine-tuning the Pohorje 2 course. However, after 24 racers completed the first run, including Resi Stiegler, of Jackson, Wyo. finishing 13th, the race was cancelled due to unfavorable course conditions. In Garmisch, the start for the men’s giant slalom was moved down due to wet snow overnight. However, weather conditions continued to deteriorate as wet snow changed back to rain and the race was officially cancelled. “We were prepared because yesterday the weather forecast predicted exactly this,” said Markus Waldner, Chief Race Director. “So we went up to the hill at five in the morning, there was 20 cm of fresh snow at the very top so we immediately moved the start down to Seilbahnsprung and concentrated the work with the 180 volunteers on the lower part. They worked hard and cleaned the race line, which allowed us to confirm the program with the racers’ inspection. The International Ski Federation has yet to release any update on whether or not these races will be rescheduled later in the season. Up next, the women travel to Garmisch for downhill and super G races Feb. 6-7. The men travel to Jeongseon, Korea, for downhill and super G Olympic test events Feb. 6-7.